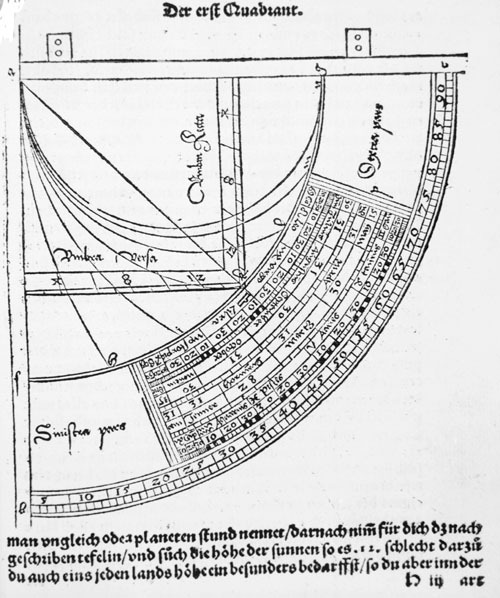 The quadrans vetus or old quadrant, so called to distinguish it from the quadrans novus or astrolabe-quadrant devised by Profatius (Jacob ben Machir ibn Tibbon; d. 1305), was an instrument which could be used to solve problems in surveying and, from observations of the sun, to find the time. As such its description was often included in early-modern treatises on dialling. The picture shown here comes from Ein wolgegrundes kunstreichs sumarii büchlein aller sonner uhr (Strasbourg, 1539). 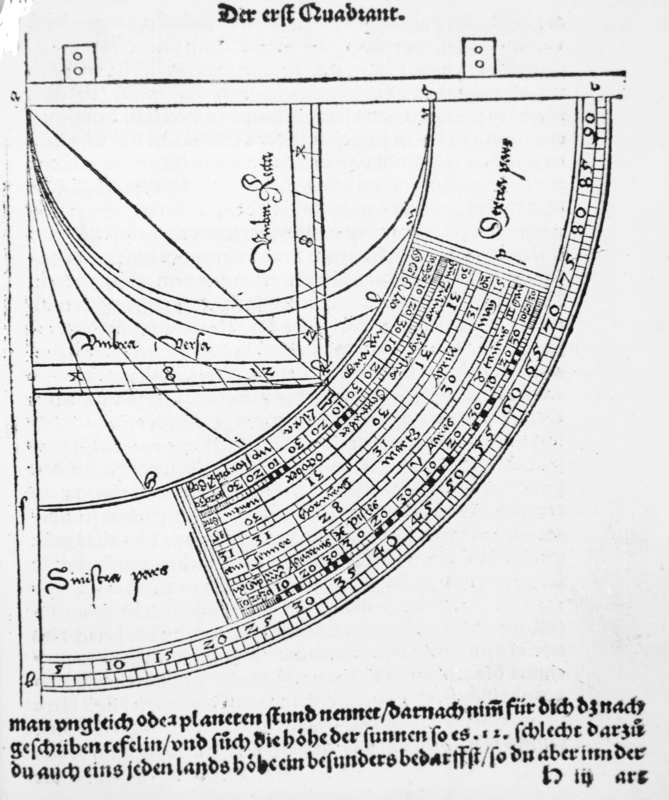 Sacrobosco's Tractatus de quadrante describes the construction and use of the quadrans vetus. He discusses two forms of the instrument, both of which could be used to find the time in unequal hours. 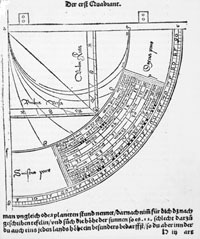 The simpler version required the use of tables from which the noon altitude of the sun could be derived for any day of the year. Sacobosco appears to have been working with a particular set of tables, derived from the Humeniz Tables compiled in Paris in 1239. The more sophisticated form of quadrant had, as in the picture, a scale co-ordinating the astronomical and civil calendars which indicated the noon solar altitudes, and which could be placed according to the observer's latitude; this substituted for the tabulated data. The Tractatus de quadrante derives in some measure from earlier medieval treatises, in particular the Astrolabium of pseudo-Messehallah. But there appears to be no direct precedent for an account of the construction of the instrument. Thus, while Sacrobosco's treatise was inadequate in this respect, and was superceded by better treatments, in particular the Quadrans vetus of Johannes Anglicus, written in the 1260s, he may have been the first to devote a work to this instrument.